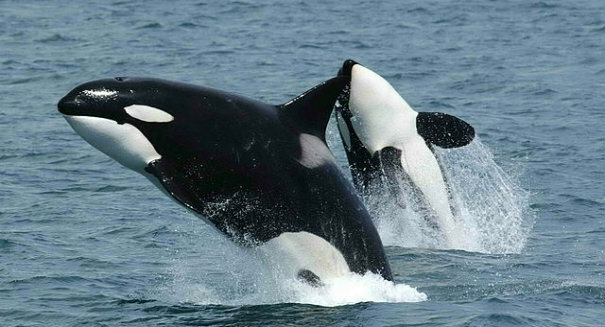 An amazing new study claims to have discovered something about killer whales that explains a bizarre feature we humans have. A big new discovery by researchers at the University of Exeter and published in the journal Current Biology claims to have finally answered the question of why humans — and just two other species in the world — get menopause, a strange quirk of biology that hasn’t seemed to make sense until now. Scientists made the finding by studying the killer whale, which is one of the other species that gets it. The study found that female killer whales tended to get more generous with sharing food with other whales as they got older, which would be a problem for their calves if they continued having them at an advanced age, according to a statement from the university. Calves never leave their mother, so as the female killer whale gets older, it would have to continue to feed more and more offspring, all the while sharing more and more with the group, and impossible task eventually if she continued having calves. It’s not quite an apples to apples comparison with humans, but it could help explain how something like menopause ends up in the evolutionary process for humans, and provides a new avenue of research for scientists trying to understand the phenomenon.